Norovirus—sometimes dubbed “the stomach bug” – is making notable appearances around the nation as winter gives way to spring. Alexandria, Virginia schools closed their doors in recent days to disinfect in an effort to stem outbreaks. Virginia students on a class trip to New York City were hospitalized after becoming sick at a performance of “Phantom of the Opera.” Norovirus is being cited as a possible factor in four deaths in a Minneapolis Veterans Home, leading to a hold on new admissions. Weld County, Colorado health officials report at least five outbreaks, most in nursing homes. And norovirus still shows up on cruise ships. According to the Centers for Disease Control and Prevention (CDC), 80 percent of norovirus outbreaks occur between November and April. As the old saying goes, “it’s not over ‘til it’s over,” and norovirus season is definitely not yet over. To protect yourself and others, wash your hands frequently with warm water and soap for at least 20 seconds (the time it takes to hum the “Happy Birthday Song” twice), and dry thoroughly. Stay home if you are sick, and even after symptoms subside, take extra precautions to avoid spreading norovirus, e.g., wash hands frequently and avoid handling food for others for at least three days. Disinfect frequently touched surfaces with a solution of bleach plus water (see posters below). 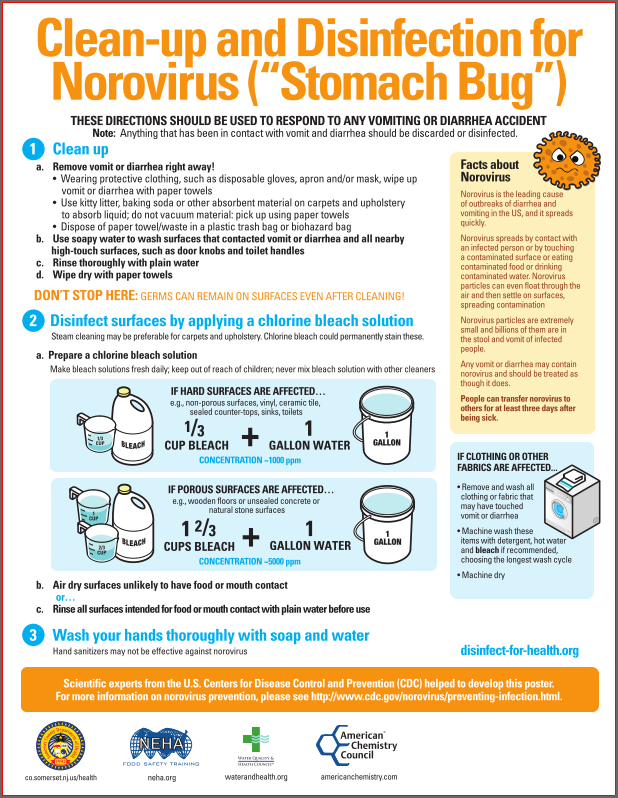 The Water Quality & Health Council worked with CDC, the Somerset County, New Jersey Department of Health and the American Chemistry Council to develop two downloadable posters on norovirus disinfection (downloadable here). “Clean-up and Disinfection for Norovirus (“Stomach Bug”)” gives directions for responding to a vomiting or diarrhea incident. 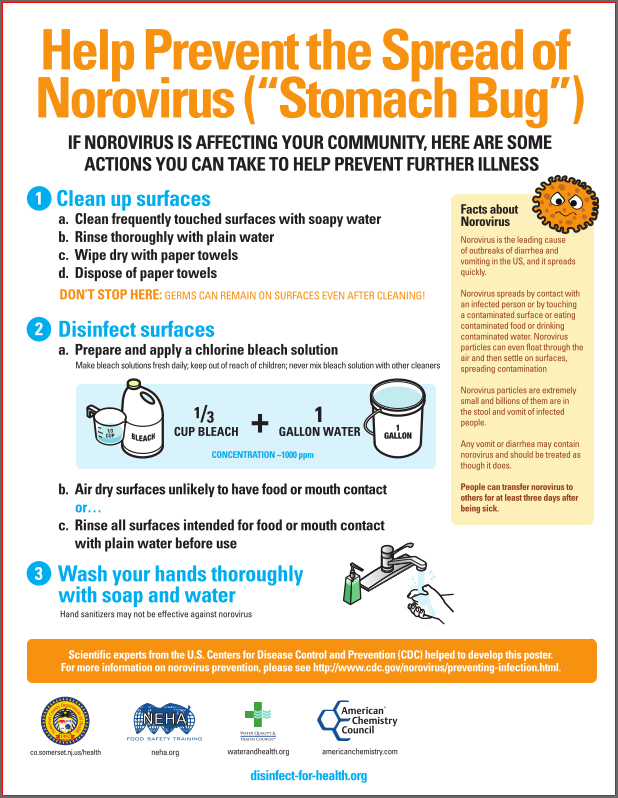 “Help Prevent the Spread of Norovirus (“Stomach Bug”)” offers tips on disinfecting when norovirus is known to be affecting the community. It is our hope that these posters will be of use in schools, veterans’ homes, nursing homes, cruise ships, and other environments in which norovirus spreads easily.